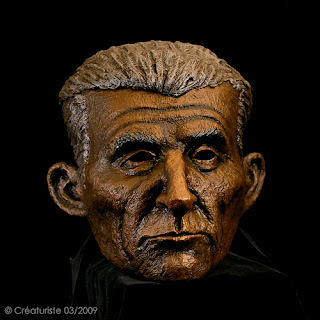 Full-head portrait mask of composer Maurice Ravel. Surprise for the show: skull opens at hairline. So are the customers. The mask works better than they expected, and since the actor is a trained mask actor, during the handing-in meeting, we had a feeling there will be more mask play during the show than originally planned (actor was supposed to wear it just to exit at the end of the show). Materials: Paper Mache Bark, Paper Mache Strips, Wire, Weldbond, "Monster Bone", Metal Hinge and hardware, Acrylic Paint, Metallic Powders. The look is exaggerated Bronze and silver. The colors are not quite right in the pics, despite the attempts at adjustments. I find it hard to photograph the proper color temperature of Metallic powder finishes. Any lighting tips for me, using household items? The features and texture are much bolder than usual, because this is designed for the largest audience size I've ever built for. It needs to be readable from afar. Customer: two contemporary full orchestras performing in one evening. 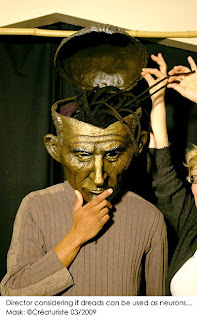 The mask will be used as a puppet head, and finally as a mask, by the actor hosting the event, giving life to Ravel between musical pieces. 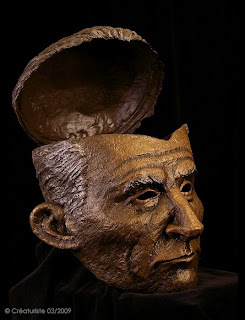 The actor wears the mask without the risk of the scalp opening by itself, thanks to wedges of polyfoam circling lower than the cranium "fracture". Each wedge has a surface of fun foam, being sweat proof and more comfortable than polyfoam. The scalp remains closed simply by gravity, and stays put, thanks to the hairline draping snugly over the head, for a centimeter. This head will be used mostly as a puppet head. The actor will build a rudimentary body that will be hidden under the bedsheets of the hospital bed. The head is just placed on a pillow, which has a hole in the middle, to allow the actor to open the skull, reach into it, and fetch objects hidden within the table or pillow. 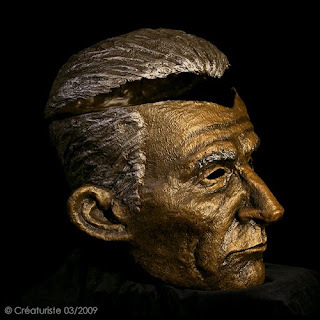 At one point of the show, he dons the head as a mask, and become Ravel, walking off the stage. When I tested the possibility of moving such a big mask-puppet-head, I found out how much movement one can get by using a pillow underneath. Very expressive, from very subtle to very extravagant. My own pillow is foam latex, which reacts even more subtly, kind of like body fat (remember that medical examination scene in the movie The Santa Clause? ), but a regular pillow will work well too. This is only the trailer for the 12 minutes short film.